If you are looking to freeze dry foods at home look no further! The Harvest Right freeze dryers are just what you are looking for. Stock up on healthy foods from the market or your garden and freeze dry them right at home. When packaged properly they can last up to 25 years! Always know what is in your food storage, because you made it. 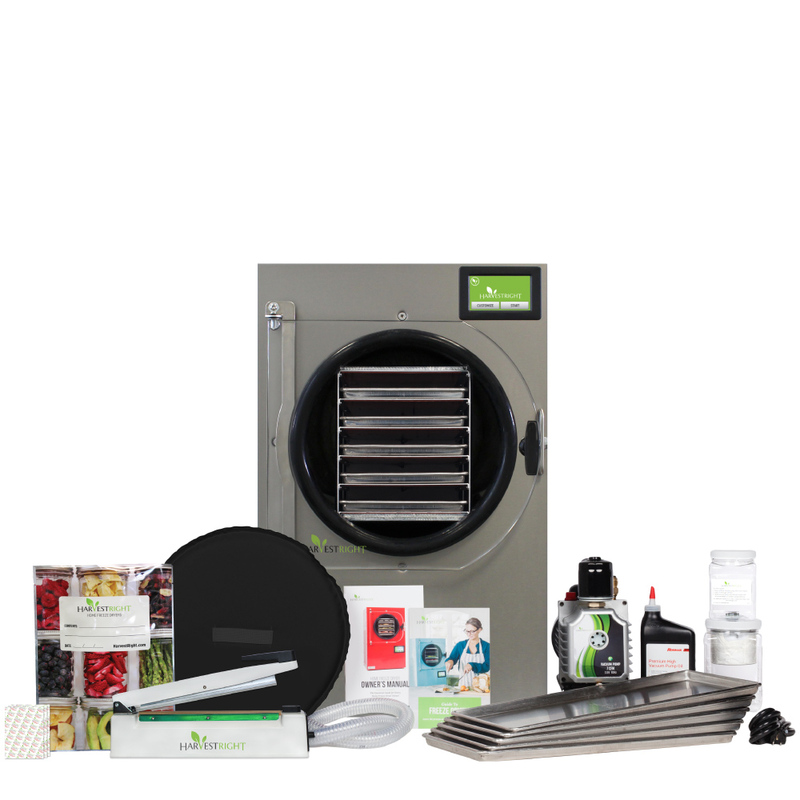 When we say Home Freeze Dryer™, we truly mean home. It provides the convenience, simplicity, and electrical power requirements of other major kitchen appliances. 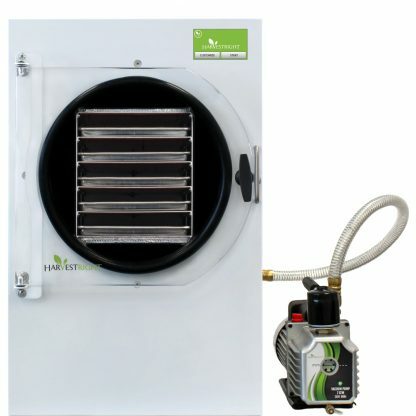 The only choice you had prior to Harvest Right™ was to purchase a commercial grade freeze dryer. With this outrageously expensive purchase ($30,000) came a learning curve of scientific methods, mechanical maintenance, and a need for 220 power. 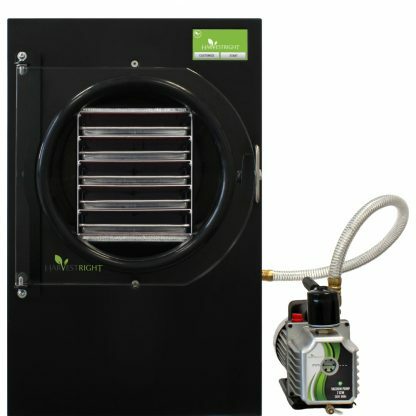 The cumbersome activity of calculating water content within specific food types to ensure proper freezing and drying procedures created frustration and wasted the users time. Additional time for monitoring the food during the process, and making corrective adjustments were also needed. 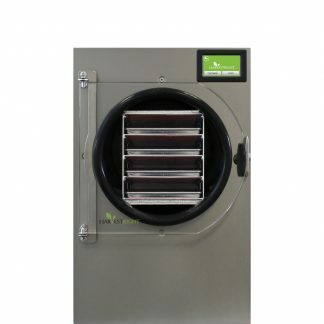 Along with only being able to freeze dry the same type of food in a batch, you had to understand the mechanical needs to properly use and maintain this commercial grade freeze dryer. In addition to being expensive to purchase, it was very expensive to run. Simply put, a commercial freeze dryer was not built for in-home use. Harvest Right™ has built the only Home Freeze Dryer™ that is truly a home appliance. It is easy to use, small in size, and has a large capacity. The smart technology allows one to simultaneously place various types of food in the chamber, press start, and walk away. By itself, the freeze dryer calculates the necessary dry time and automatically monitors the freeze dry process to completion. This makes it easy to use, as well as convenient — saving you time, money, and energy. You don’t have to be an expert to own it. Nor do you need to be a large company to buy it. It doesn’t matter what one puts in the freeze dryer. There can be pineapple on one shelf, apple on another, yogurt on a third, and a leftover meal on the last shelf. 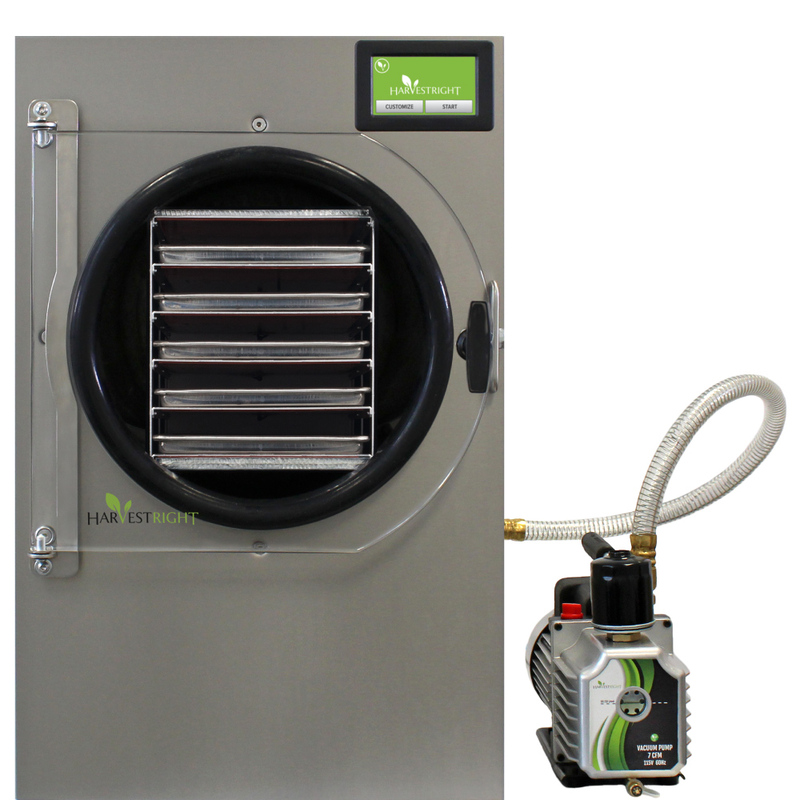 Freeze drying is remarkable because it causes no damage to the nutrition of the food being preserved. Other methods of preservation, such as canning and dehydrating, use higher temperatures that can destroy more than half (50%) the food value. 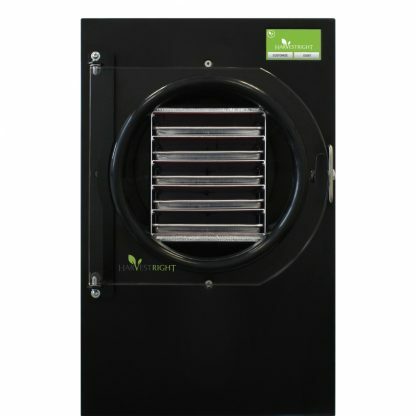 Freeze drying does not shrink or toughen the food, but retains the aroma, flavor, color, shape and nutritional content. Simply add water. Apples, cheese, avocados, meat, raspberries, peas, ice cream and yogurt will still look and taste fresh because, in reality, they still are. Without water and oxygen to spoil the food, it is as if the food has been placed in a time capsule. It will last and last and last! 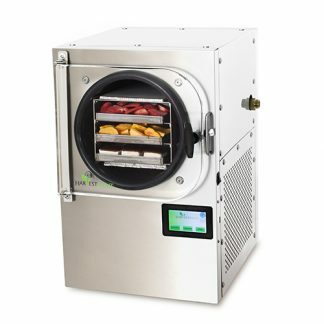 A Harvest Right Home Freeze Dryer™ allows you to preserve large pieces of tasteful, high quality food, such as apricot halves, thick peach slices, large slabs of cooked steak, whole shrimp, ice cream sandwiches, and a lot more. You don’t have to settle for the small dices or shavings of fruit or meat that you find in store bought, freeze dried products. Prepare it and preserve it how you want it. 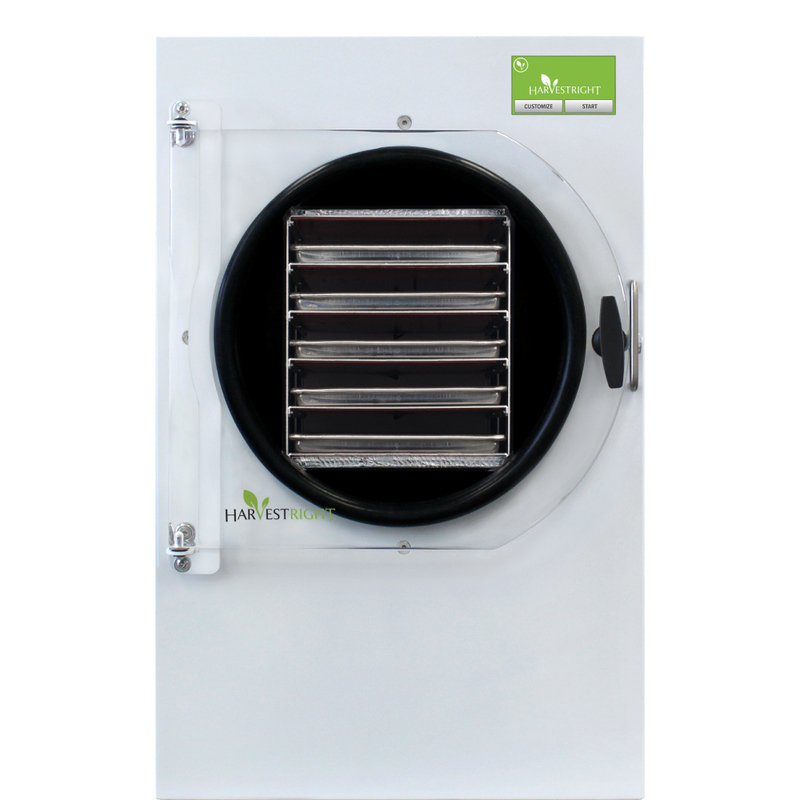 Overview: Patented technology preserves the taste, nutrition, and texture of nearly any food for up to 25 years. Perfect for freeze drying fruits, vegetables, meats, dairy products, meals, desserts, and more. 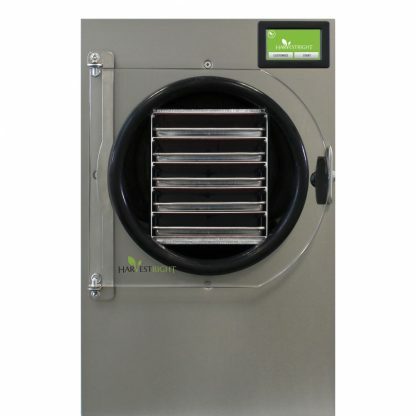 Features: Freeze dry 2500 pounds of fresh food per year (12-16 pounds per batch). In a year’s time, you can freeze dry 546 gallons of food. Easy to use. Just press start and the freeze dryer will beep when finished. Dimensions: Overall product dimensions: 22.5” W x 25.5” D x 32.5” H. Perfect for a countertop, cart or table. Maintenance: Simply filter and replace oil. Takes one or two minutes.